Photodigm has been recognized by the DARPA SBIR/STTR program for its successful completion of its recent Phase II SBIR contract, N10PC20139, High-Power, Narrow-Linewidth Laser Diodes for Alkali Atoms. 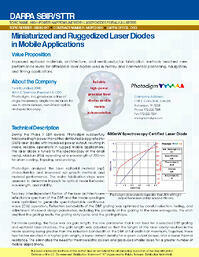 During the Phase II SBIR award, Photodigm successfully fabricated high-power monolithic distributed Bragg reflector (DBR) laser diodes for rubidium spectroscopy, reaching new performance levels for affordable and readily available laser diodes used in military and commercial positioning, navigation, and timing applications. The announcement is available for review on the DARPA website.